At 170 billion barrels, Canada's Oil Sands are the third largest reserves of developable oil in the world. The Oil Sands now produce about 1.6 million barrels per day, with production expected to double by 2025 to about 3.7 million barrels per day. The Athabasca Oil Sands Region (AOSR) in northeastern Alberta is the largest of the three oil sands deposits. Bitumen in the oil sands is recovered through one of two primary methods – mining and drilling. About 20 per cent of the reserves are close to the surface and can be mined using large shovels and trucks. Of concern are the effects of the industrial development on the environment. Both human-made and natural sources emit oxides of sulphur and nitrogen, trace elements and persistent organic compounds. Of additional concern are ground level ozone and greenhouse gases. Because of the requirement on operators to comply with the air quality regulatory policies, and to address public concerns, the not-for-profit, multi-stakeholder Wood Buffalo Environmental Association (WBEA) has since 1997 been closely monitoring air quality in AOSR. In 2008, WBEA assembled a distinguished group of international scientists who have been conducting measurements and practical research on various aspects of air emissions and their potential effects on terrestrial receptors. This book is a synthesis of the concepts and results of those on-going studies. 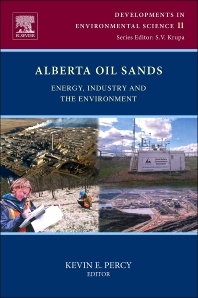 It contains 19 chapters ranging from a global perspective of energy production, measurement methodologies and behavior of various air pollutants during fossil fuel production in a boreal forest ecosystem, towards designing and deploying a multi-disciplinary, proactive, and long-term environmental monitoring system that will also meet regulatory expectations.